“Any tool is only as good as the person who uses it,” Norma Jeanne Laurette says. She knows that firsthand, especially when it comes to dog gear. Using your dog’s gear wrong — or using the wrong gear for your dog or the situation — can be dangerous to both human and canine. So how do you know if your dog’s gear is wrong? Dogster sought the advice of five training and gear experts to lead you in the right direction. Don’t make these mistakes when choosing dog gear! Photography ©DanAlex120714 | Getty Images. In dog gear, as in life, there are some universal truths. Don’t judge a book by its cover. No one size fits all. Slow and steady wins the race. And above all: Learn from your mistakes. Dog gear mishaps start in the store. “A dog owner may just choose dog gear based on appearance without having a proper understanding of it,” says Megan Stanley, board chair of the Lexington, Kentucky-based Association of Professional Dog Trainers and owner of Dogma Training & Pet Services Inc. in Alberta, Canada. Collars in particular fall into this category. “People often choose a collar for its color and print rather than for its durability and safety,” says Terri Bright, PhD, director of Behavior Services at MSPCA-Angell headquartered in Boston. While a collar with bling might be attractive, it’s not always the best choice. “Be aware of how heavy equipment can be on the dog, such as a heavily adorned leather collar,” Megan says. Do your homework before buying gear. “It is important that we research all equipment and ensure it is the best gear for our dogs,” Megan says. Know how to fit and use each piece of gear properly, and understand its potential risks. “Proper fit and technique is important, not only for the equipment to work properly but also for the dog’s comfort and safety,” Norma Jeanne says. Make sure gear is the right size and adjusted properly for your dog — not so loose it can come off or so tight it constricts. People often are so concerned about equipment being too tight on their dog that they wind up with gear that’s too loose, says Travis Brorsen, host of Animal Planet’s My Big Fat Pet Makeover television series. He advises people to think about what happens when we wear shoes that are too big: blisters. Conversely, tight gear can be painful. “Collars or harnesses that are too tight can rub hair and skin off,” Terri says. Properly fitted gear makes training easier because it provides optimum stability and support, Travis says. The rule of thumb for fitting a collar is the two-finger rule: When the collar is fastened, you should be able to get two fingers comfortably between your dog’s neck and the collar. A collar should be the width of two of your dog’s vertebrae and snug enough that you cannot pull it past the ears. The two-finger rule also applies to harnesses. A harness should be snug but loose enough that it doesn’t push into the chest when the dog sits. To determine the right size for your dog, wrap a cloth tape measure around your dog’s chest just behind the front legs. An adjustable harness allows you to get a more custom fit. Don’t just toss a new piece of gear on your dog. Introduce equipment slowly, and teach your dog to like it. Desensitizing your dog to gear will prevent stress, anxiety and fear. Even seemingly innocuous gear like dog booties requires practice. Dogs don’t take to booties like a person does to a pair of socks; they need time to acclimate to footwear. So even though you might not be thinking snow right now, start well before your dog needs foot protection from inclement weather, Travis advises. Positive training can help your dog love his gear. Photography ©DanAlex120714 | Getty Images. “The biggest mistake most dog owners make when selecting gear is choosing aversive training tools,” trainer Megan Stanley says. Aversive gear includes choke, prong, pinch and shock collars that punish unwanted behavior. Animal Planet television host Travis Brorsen concurs. “This is old-school and outdated,” he says. Positive-reinforcement training is based on mutual trust and respect rather than fear and intimidation. The method teaches good behavior by rewarding correct choices. If the right choice has a benefit — praise, treats, a gentle pat — a dog is less likely to make a wrong choice, Travis says. “Without proper training to walk on leash, any tool can cause physical injury if a dog pulls on it for too long,” Megan warns. Pressure on a dog’s sensitive neck can cause ear and eye issues and damage the trachea and thyroid gland, she says. To take the force off the neck, our experts recommend using a harness with a leash attachment at the front. Have multiple harnesses to vary pressure points, Victoria suggests. 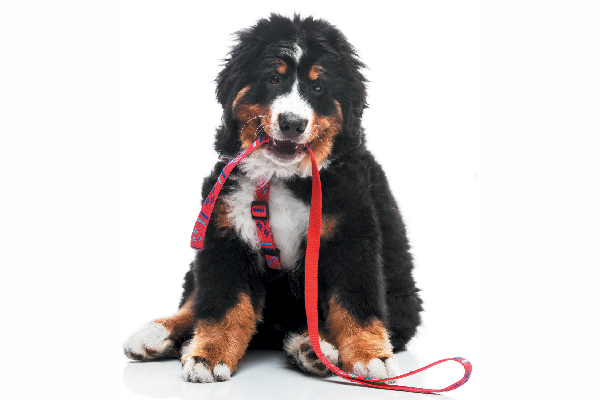 “You don’t wear the same clothes every day, so why should your dog?” Any leash that is too long can tangle and trip people and dogs, but retractable leashes require particular care. “There are many recorded injuries from minor to severe from people grabbing the [retractable] leash or getting tangled in it, causing rope burn or breaking bones,” Megan says. If you use a retractable leash, attach it only in open spaces where there are few objects, no traffic and no other dogs or people. Dogs at play can be ensnared by a loose collar or injured by bejeweled, studded or spiked collars. “It is recommended that collars be removed during play, especially any collar with a chain on it, or use a quick-release collar,” Megan advises. Gear-related injures can do more than physical harm; they can affect a dog’s emotional well-being, Norma Jeanne notes. “Any of these injuries can also result in damage to the human-canine trust bond,” she says. Every dog is special, but certain breeds and sizes need special gear. Brachycephalic breeds (those with a broad, short skull that results in a flat face or short nose, such as Lhasa Apsos, Pugs and Pekingese) can have breathing issues, so it’s vital that gear doesn’t strain their throats, Travis says. They also are more prone to heatstroke, so cooling harnesses are a good choice for these breeds, Megan says. “For the brachycephalic breeds that need to be muzzled, people take risks with the wrong type of muzzle,” Terri says. She recommends using a muzzle specifically designed for short-snouted dogs. Size matters. A large, powerful dog like an Irish Wolfhound might best be walked using a head halter, especially for a child or senior who might have trouble holding onto a big dog. For small dogs, such as Italian Greyhounds, wide collars and soft harnesses work well, Victoria says. And dogs with narrow heads, including Greyhounds, need a martingale collar (one with a large loop for the dog’s neck and a smaller sliding loop that attaches to the leash) so they can’t slip out of it, Megan says. 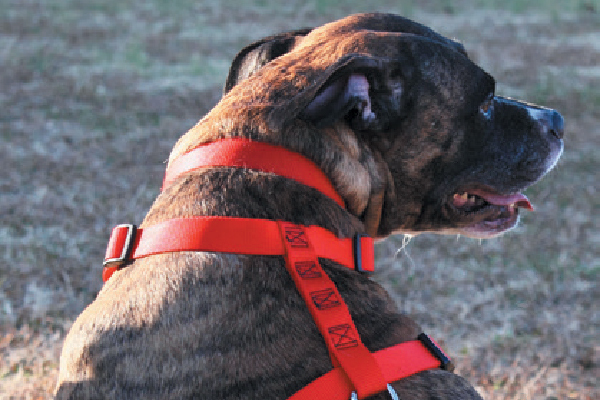 Martingale collars also help prevent pulling without choking. When in doubt about the right dog gear, consult your veterinarian or a professional trainer. Terri Bright, PhD, director of Behavior Services at MSPCA-Angell headquartered in Boston. Travis Brorsen, host of the television series My Big Fat Pet Makeover, founder and CEO of Greatest American Dog Trainers. Norma Jeanne Laurette and Greg Ceci, trainers, instructors and co-chairs of the International Positive Dog Training Association (founded by Norma Jeanne) in Ontario, Canada. Megan Stanley, board chair of the Lexington, Kentucky-based Association of Professional Dog Trainers and owner of Dogma Training & Pet Services Inc. in Alberta, Canada. Victoria Stilwell, star of the television series It’s Me or the Dog, judge on television’s the Greatest American Dog, CEO of Victoria Stilwell Positively Dog Training and Dogster contributor. St. Louis-based freelance writer Martha M. Everett has lived on both coasts covering everything from Washington to Westminster. More interesting, her Keeshond-mix rescue, Trooper, helped set a World Record for the Most Dogs in Costumed Attire. Thumbnail: Photography ©Jonathan Mauer | Getty Images. The post The Pros Weigh in on Choosing the Right Dog Gear appeared first on Dogster.